This page includes posts archived from my old business site: Excellence in e-Education (xlents.com). 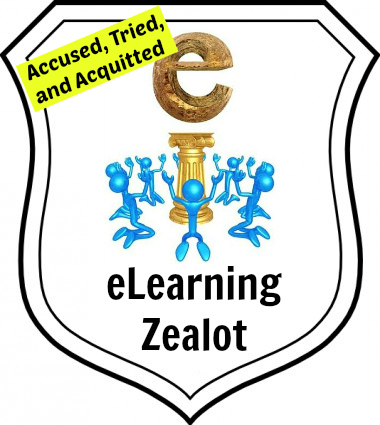 This series of posts relates to the 2011-12 webinar series that I ran for a group of clients. Description: To date there is only one nationally-normed, student satisfaction survey that is aimed specifically at online learners. We’ll take a look at the valuable information that can be gained from gathering satisfaction data from your online learners and how you can get improvements over time in the levels of satisfaction. We’re going to try something different (again) with this final webinar. Let’s call it an “Asynchronous Webinar.” I’ve recorded it in advance so that you can watch it when time allows. Please ask your questions or otherwise provide your feedback through the comments section of this post. I will reply to your comment postings. One of my great frustrations with the webinar format is the overall lack of interaction. Usually there are a few comments and questions posed during the live session, but it seems that there is a general lack of feedback from the audience. Pretty sure that’s on the webinar presenter/organizer (me) for not finding ways to engage the audience more fully. Lesson learned. Finally, as I near the end of business for Excellence in e-Education, I will be making all 12 of the webinar recordings available for your use through a single landing page. Look for that very soon. Screenshots of various charts of student data gathered over the years. Description: Three main recommendations came out of the CCRC reports on online student success rates in Washington and Virginia. These reports stressed the importance of a required orientation for new online students, high levels of student support services, and robust professional development opportunities for online faculty. 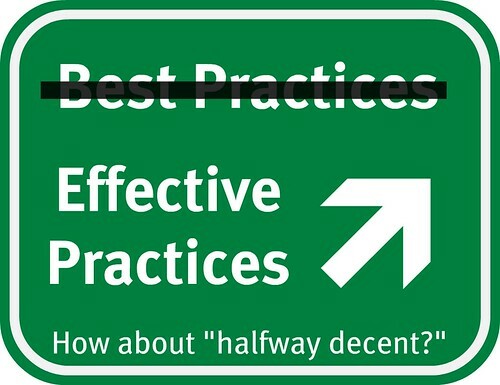 We’ll look at effective practices in each of these areas. Offering developmental education courses (also referred to as pre-college or remedial courses) via online delivery has been controversial for as long as memory serves. “You just can’t possibly do it!” is a familiar statement from the naysayers. Believe it or not, there are people who are doing it and doing it well. One of those doing it well is our guest presenter, Donna Gaudet of Scottsdale CC. Donna teaches online pre-college math courses. I have also included content in the webinar from Kirsi Halonen from Lake Superior College. 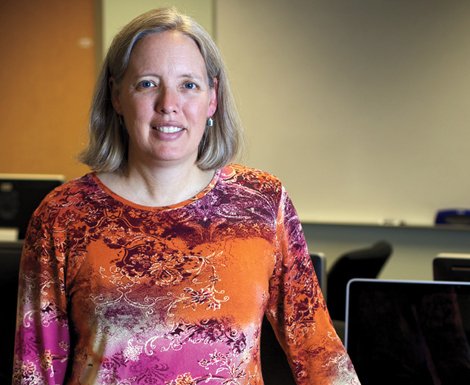 Kirsi has been teaching online developmental writing courses for many years. This online seminar is our first try at what can be called an “Inverted Webinar” (or “flipped”). The purposes of an inverted webinar are to allow people to absorb the content in advance and at their own convenience, and then to have a more interactive, conversational live session. The live session was held on Tuesday, 3/6/2012 at 1:30 PM central time. On 2/7/2012, another Excellence in e-Education webinar was offered. 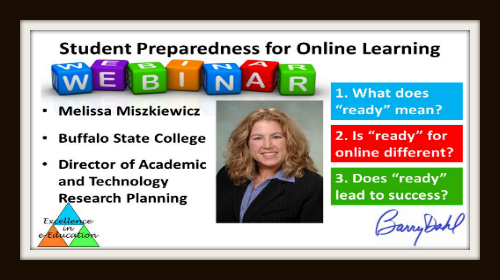 The title was “Student Preparedness for Online Learning” and the guest presenter was Melissa Miszkiewicz from Buffalo State College. Melissa is one of the co-creators of the Online Learning Readiness Survey (OLRS) (20 pg. PDF). This example was not chosen because it is particularly good or bad, but because it is representative of the many different items from many different sources (individual faculty, departments, colleges, consortia, etc.) that try to get at the question of readiness. The vast majority of these have had no validity testing or any other kind of testing or verification. MCCVLC – Is Online Learning Right for Me? At the other end of the spectrum is the tool that is most likely the big dog in this space, SmarterMeasure (formerly READI). In particular, we looked at some of their data from the 2011 Online Student Readiness Report. Overall, this appears to be a fine tool. I tested it at my former college but decided against adopting it for various reasons. The one area now that I find most questionable is the section dealing with learning styles. More on that at another time. The OLRS is still under development but has already gone through more validity testing than most of the other measures that I am aware of. They worked directly with students while performing their item analysis and this led to a great deal of revision in the questions/statements in the survey. They worked very hard at making sure that students read the questions and understand them to mean what the researchers intended them to mean. This is a shortcoming of most surveys developed unless they go through a rigorous testing process. The OLRS is free to use although an MOU with the developers is needed. Contact Melissa for more information. In closing, one of the main reasons that I am such a fan of the work that Melissa and her colleagues are doing is because it is a project being run internally by people in higher ed, for the benefit of others in higher ed. We need a lot more of that. Description: Short Message Service (SMS), commonly referred to as text messaging, is the preferred means of communication for a majority of traditional-age college students, and rapidly becoming more popular with older students as well. Many educators don’t want to send and receive text messages with students, primarily due to privacy concerns or technology concerns. In this session you’ll learn how you can do it safely, easily, and for free. You’ll also learn WHY you should be doing this. Here is the link to the complete webinar archive. Below are links to many resources used during the webinar. 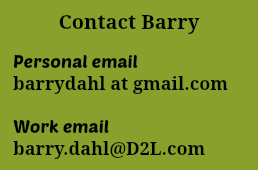 7) Link to my (Barry Dahl’s) Broadtexter page – showing embeddable widget and message board. There seems to be a great deal of division about the question of whether this is a good idea. Feel free to share your thoughts in the comments. Excellence in e-Education has developed a comprehensive set of documents, processes, and procedures related to the evaluation of online faculty performance. This information is available to be shared with clients through webinars or on-site workshops. 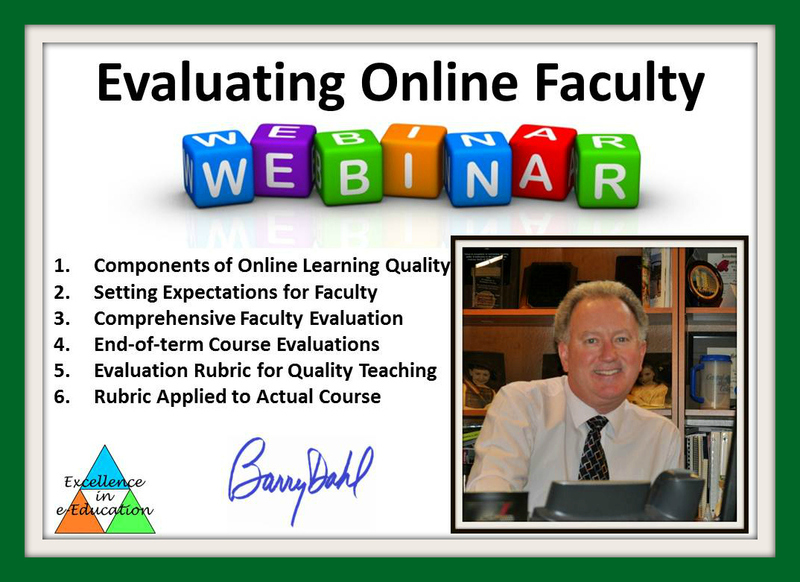 Description: In this two-part webinar, we will examine two aspects of online faculty evaluation: Part one deals with the end-of-term course evaluation completed by online students. We’ll look at good practices for administering the end-of-term evaluations, including strategies for increasing submission rates. Part 1 is Thursday, Nov. 29 at 11:00 AM central. A sample end-of-course evaluation instrument for online courses will be shared with participants. Most schools that offer online learning have not developed the tools and expertise needed to evaluate the quality of online instruction. In the second part of this two-part webinar, we’ll examine the administrative evaluation of online faculty performance. Attendance at part one of this series is not required for part two. Part 2 is Thursday, Dec. 6 at 11:00 AM central. For those registering for part 2 prior to December 6 – you will also receive the URL to the archived video of part 1. You will have access to both archived webinars for 2 years. A sample faculty evaluation rubric will be shared with participants. 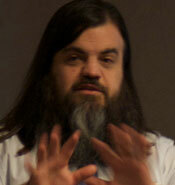 Bryan Alexander will join me to discuss the various uses of digital storytelling (DS) in educational settings. In my opinion, DS is one of the hottest topics in educational technology and something that can be embraced by faculty, students, and staff at any educational institution at any level. Description: How can we use digital storytelling for teaching and learning – and why should we? In this one hour webinar, Barry Dahl and Bryan Alexander introduce digital storytelling for education. We explore the classic model, outlining its educational uses, including assessment and support aspect. We then add on new digital storytelling methods, including Web 2.0 and gaming. 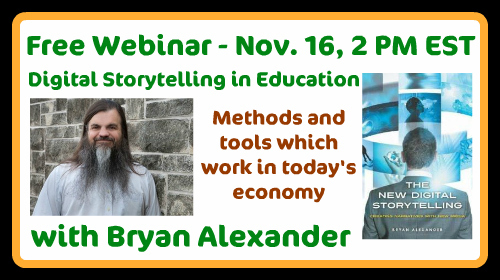 Feel free to view, enjoy, share, and learn about Digital Storytelling from Bryan Alexander in this webinar that was recorded on Nov. 16, 2011. Bryan’s bio at NITLE website. 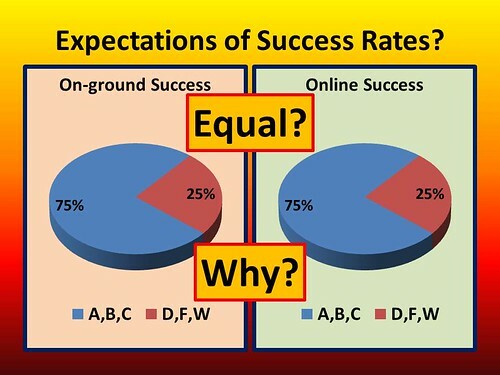 Online Course Completion Rates: What are the expectations, and why? This first post is intended to mainly share all the links used in the webinar. I’ll write additional posts that explore some of the topics in more depth. Chronicle: Why Are So Many Students Still Failing Online? – 5/22/2011 (This feels to me like it would have been written about 10 years ago, based on the naivete of online learning). Online education will be big in America, because that’s what we do: we take sublime and beautiful European classics and turn them into pablum. We took Belgian ales and made Miller Lite, we turned Neapolitan pizza into Dominoes, The Mini became the Ford Flex Super Wagon, Pasta became Spaghetti O’s, and fresh French baguettes became Wonder bread. We’ll do the same with school, because that’s what we do. Description: Join us for an in-depth look at the copyright concept of Fair Use and how it applies in education. Author and Professor Patricia Aufderheide from the Center for Social Media at American University will be our special guest speaker. Pat is the co-author of the book: Reclaiming Fair Use: How to Put the Balance Back in Copyright. We will include time for questions and answers as well. Don’t mix up fair use and educational exemptions. Teachers and scholars have significant rights within copyright law, but they are limited to mostly traditional educational settings. As both students’ and professors’ work moves outside the classroom, whether in a video posted on YouTube or a slide presentation on SlideShare, they’ll need to employ their fair-use rights to participate in 21st-century education. Don’t confuse fair use with the open-source movement or Creative Commons. The open-access movement works to expand the amount of material available on either a copyright-free or a copyright-light basis, such as a Creative Commons license. The impulse to share scholarly research more freely is an admirable impulse for any creator who wants to do so. Fair use, however, focuses on a different issue—specifically, when new creators and researchers want to use work that its creators do not want to give away. It permits unauthorized use of material that is normally closely guarded. It keeps copyright holders from becoming private censors of future culture by denying access to building blocks of new work. This is your opportunity to learn about Fair Use from a leading expert in the field. In addition, we’ll hold a random drawing to give away copies of her new book to at least ten lucky participants. Register today!! Only 50 spots left. Schools that are subscribers for the annual webinar series do NOT need to register again for this session – you’re already in! Description: Faculty who teach online typically need to make themselves available to their students via online office hours. How office hours are held for students at a distance is sometimes a matter of choice, and other times a matter of college policy. In this webinar, we’ll look at four different web-based tools that enable faculty to connect electronically with students in a one-to-one or a one-to-many real-time environment. All of these tools are free to use and do not require students to create accounts in order to connect. Are your college faculty and the administration on the same page about what is expected of online faculty? Do online students know what the college expects from them when they register for an online course? What about the other way around? 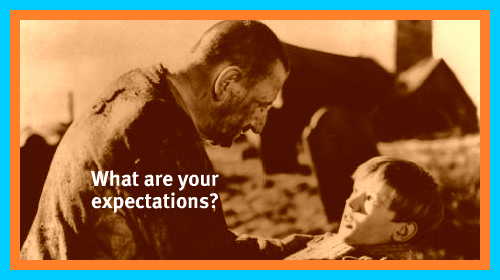 Do students and faculty have clear expectations of what they can expect from the college? Have you clearly defined the following items? An important part of improving the quality of online education offerings within higher education is the process of setting clear expectations for online students, online faculty, and the college administration. During this webinar we will examine some of the consequences that you might incur if you haven’t set clear expectations. Additionally, we will look at some examples of the expectations that you can use as the starting point for creating your own institutional list of published expectations. Without this information being readily available and widely disseminated you can expect ACFUD (angst, confusion, fear, uncertainty, doubt) from any or all parties. Contact Barry Dahl for more information.